As a single working mom on a budget, I’m not usually big on spending even a few bucks on greeting cards that recipients look at for two seconds and then throw away. Recently, though, I saw a card that screamed to me. Clearly, this was a message from the cosmos. It turns out that the quote on the card is a popular self-help-type saying that appears on an endless array of knick knack-y items, like mugs and refrigerator magnets. To make this one worth the purchase, I wrote something inside it and gave it to my daughter. An investment in both of our futures. After all, nothing — I repeat, nothing — has challenged my comfort zone like parenting, haha! Seriously, though, being a mom is one of the most important privileges in my life. Long ago, a wise woman told me that if I became the kind of mother who paid attention, someday, if I was lucky, my daughter would become my teacher. With that in mind, I see this greeting card as a call to action. If I make it my mantra, it will surely transform the year ahead. There will be opportunities to apply greater openness to other relationships as well, and also to new projects. The whole idea of finding my personal edge and living right there is very exciting. I’m thinking of it as a new horizon. No matter how scary, making changes will keep me fresh. So…I hope 2014 brings you many wonderful surprises. Best wishes from me to you for solid health, personal peace, much love, opportunities for creativity and lots of laughter. And on the inside had a drawing of a very grouchy Santa saying, “because I’ve had it up to here with that crap – that’s why!” I still laugh every time I think of it. Toby, that’s cute! My mom used to save Christmas cards too. After she died, I found a whole photo album with cards carefully laid out on each of the album pages. Wonder if I still have it somewhere. Those cards would qualify as vintage now…As for me, I never send out Christmas cards. Gradually, people stopped sending them to me too. 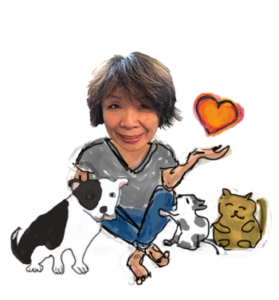 While the cards I do get are still very sweet, the greetings I get and give mostly happen on line now. So here’s my chance to send you a personal wish for a happy 2014! And don’t get me wrong…comfort zone is wonderful. It’s great to have comfort zones. But what about you and everyone else reading this? What might be some of your personal edges? I hear you, Dan! I love my comfort zones and rely on them to keep me grounded. Taking any sort of language course would be way beyond my comfort zone. I totally relate to your issues with traveling alone. Still not easy for me. Traveling with other singles has been hit-or-miss too. But practice is important, right? Just gotta get out there. The most fun I’ve ever had traveling alone was when I attended a ballroom dance weekend in the Catskills. I didn’t know anything about the organization but it sounded fun. Ended up going back several times. On my last sign-up, I brought along a married friend whose husband had no interest in dancing. We had a blast. Over the years, I’ve also learned to go to the movies and dine out alone. The trick to this is, avoid doing this on typical date nights like Friday and Saturday! There’s nothing more miserable than going out when all the couples are out too. You know what? I learned to enjoy it. Very satisfying to find a way to get outta the house. Good luck with being social and with your French studies! 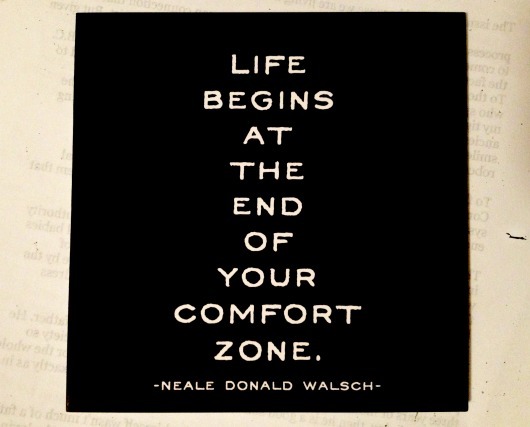 It’s also generally true that YOUR COMFORT ZONE BEGINS AT THE END OF YOUR LIFE. For most of us, it takes a lifetime of finding out how wrong we can be before we can begin to get things right. — that despite any talents we might have, we are ordinary, fallible people like everyone else on this planet — and that despite everything we’ve done wrong, we’re basically okay. Once you know you’re basically okay, you know longer HAVE to be right. Your inner hearing and vision improve and voila! You can spend a lot more time in your comfort zone — taking chances. Ingrid, what an interesting idea. I take comfort in your twist on the comfort zone! But what about young people? They can’t wait that long to find their comfort zone. Any words for them? For that, I like your second paragraph, the idea that “once you know you’re basically okay, you no longer HAVE to be right.” I’m in! I’ve heard kitschier for sure. This is a great mantra! Thanks for sharing, Betty. Happy new year to you, your family, and my fellow Betty’s-blog-fans!